We just updated the Board View look. You will notice a better, more compact layout, new avatars and other small changes. You can also now hide more information from the ticket (dates and names). And, as a bonus, it also renders faster, especially when handling a large number of tickets. 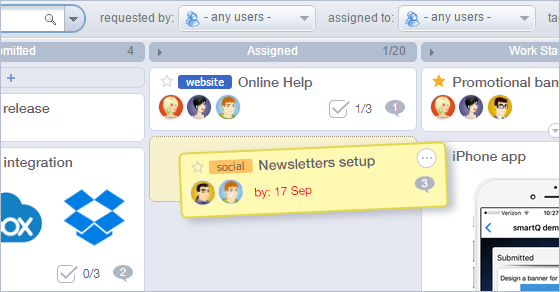 Next planned update — extending the number of fields that can be displayed in Board View, including custom fields. Are you referring to the avatars? You can go to “options” to modify that. You can switch back to names and even hide them. Is there anyway to give an option to actually change the font on the board back to what it was originally? No, the font can not be changed back. Is the new size too big for you?